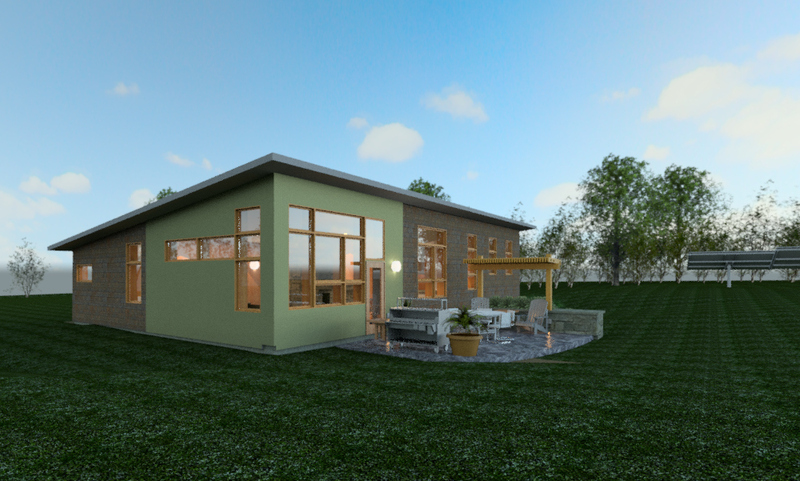 A small house design prototype modeled along a classic modern design aesthetic updated with green building design advantages and an intentional blending of inside and outside space to help homeowners connect more closely with their surroundings. 1,300 sf +/- of single level living space, 2 bedrooms, 1-1/2 baths, storage and utility spaces with a flexible kitchen-dining-living area whose space extends to a generously inviting stone terrace and solar shade pergola. 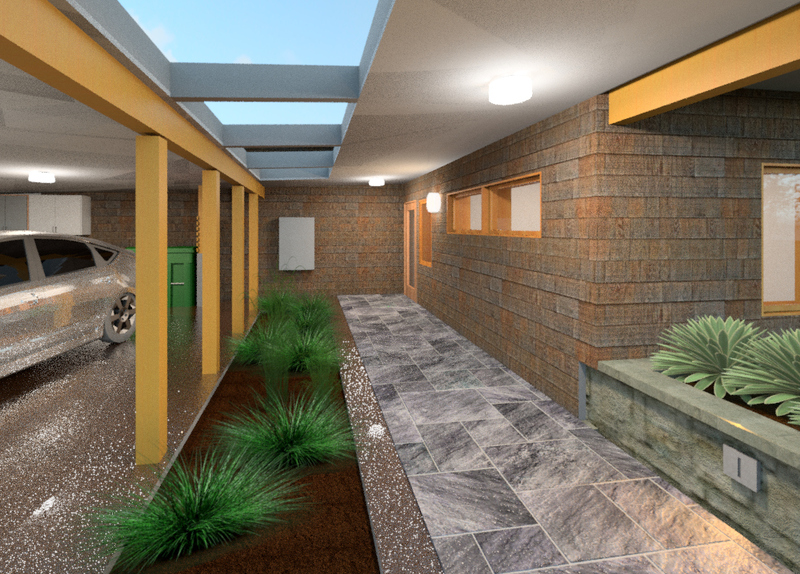 700 SF of entry atria and carport / maker space, generous hardscape which could be paved by pervious pavers. 4.5 KW of roof mounted solar photovoltaic on the carport roof with up to another 5.2 KW ground mounted solar tracker with the use of Tesla Powerwall battery storage technology to promote off the grid living, enhanced resilience to the effects of climate change, and energy cost predictability. Lower roof graywater harvesting for watering plant lies on the south side of the atria carport served by a gutter extension. 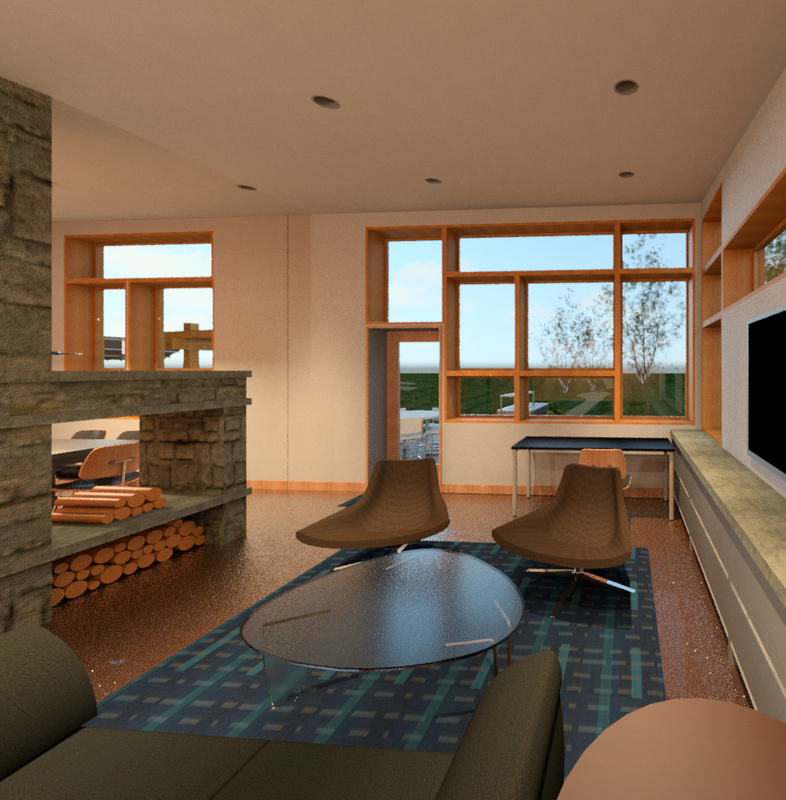 The home is shown as double wood wall construction with dense pack cellulose and 2" of rigid exterior outsulation comparable to an R-40 insulation level. The roof is built from 18" roof trusses, loose pack cellulose, fully vented 30 year (rubber) roofing system comparable to R-60 insulation levels. The floor slab is insulated with 4" of EPS foam to an R-20 performance level. The slab could be polished concrete with beautiful stone aggregate strewn in for decorative effect with optional color added. Base windows would be low-e argon filled triple insulated wood (interior) fiberglass (exterior) at R-10 levels, or alternatively double insulated argon filled with a bit lower performance and cost. The exterior siding shows a mix of cedar shingles and metal siding over a rain screen sub-assembly. 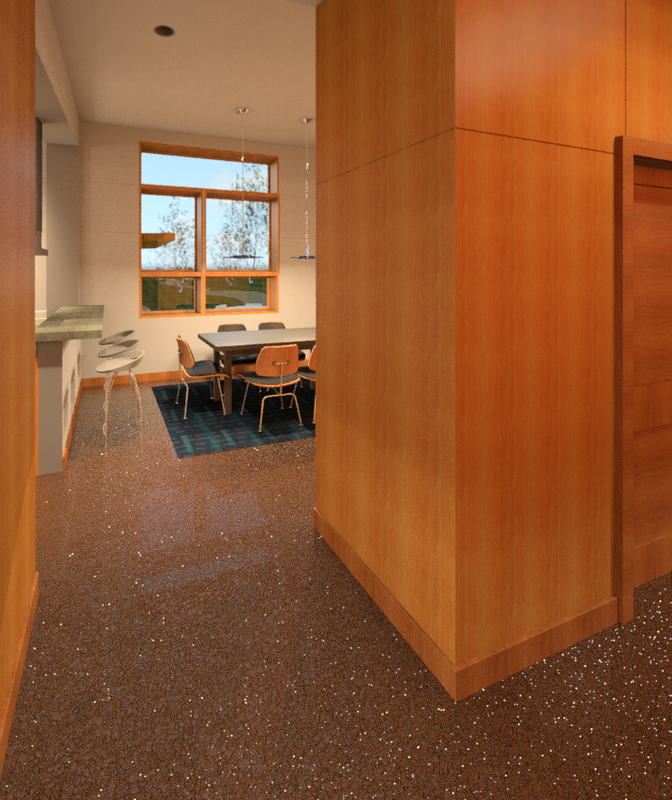 Organized around a larger rectangle plan, your enter the home deep within it after entering through a skyspace atria shared by the carport and makerspace area. When you enter you have a choice to turn left to the common spaces or go down the hall to the bedrooms. The plan almost encourages a clockwise use of the interior spaces. The single living level recognizes the growing need for homes allowing older homeowners age in place, reducing the need to further downsize to apartments, condos. Reducing stairs and level changes also simplifies construction and ultimately costs. Inside Out House can be designed to be accessible ready with closer attention to bathroom and kitchen design as desired. This house concept is meant as a point of departure as a design with many ways to add value to family living both internally and externally. For example the added exterior terrace spaces you see at the back could be if staged to come later to with less upfront costs in the first building phase. 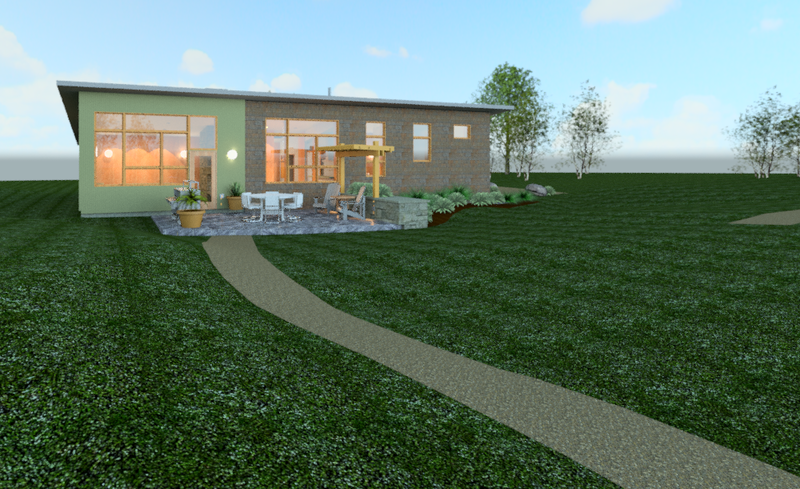 We intend this design to stir your thoughts for possibilities for how you and your family may live in the future. Merely a departure point, it represents a place to begin the design and value conversation together. Note, size as shown in the images for one family might be too small,.and for another family way too large. We would work with you to adjust the design to your needs. However, with the increasing impacts of climate change and other factors we do need to think differently about house size and ultimately how and where we live. We like to encourage our clients to consider walkable properties closer or within village or city centers reducing reliance on fossil fuel powered cars, and creating healthier people and communities. Of course those properties tend to be more valuable hence expensive. However less space and simpler living closer in to a vibrant community offers many tangible and intangible values, not so easily found n the country or more remote settings. In regards to rightsizing to your needs, the floor plan could be refined and made smaller with less space internally with the trends to shifting mindsets towards more compact, smaller bedrooms, living areas, less bathroom, tinier appliances and more. It's all about balancing needs versus wants for livability, creature comfort, and flexibility keeping in mind long term total costs of ownership and affordability over the course of your time horizon in the home. Want to continue the conversation? Click the contact us button and send us a message. If you want to receive updates from the Arocordis blog remember to click on the opt in button.